Next Tuesday marks the 17th anniversary of 9/11, and New Yorkers have already gotten a powerful reminder of the tragic events that took place in Lower Manhattan in 2001. 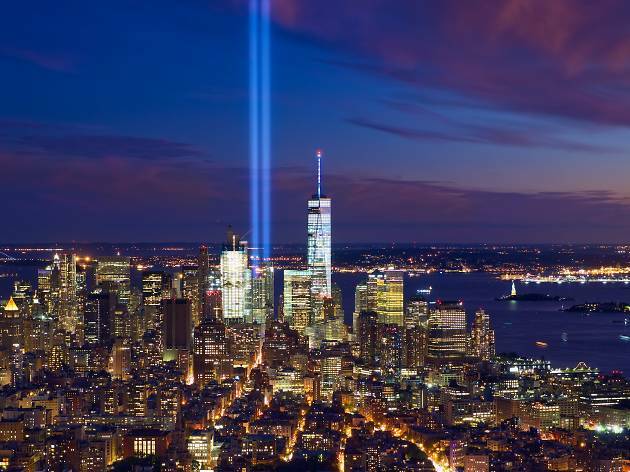 Earlier this week, the 9/11 Memorial and Museum started testing its annual “Tribute in Light” installation, a pair of giant beams that mimic the position and shape of the Twin Towers of the World Trade Center. The lights will appear over the city for another pair of planned tests on Thursday and Monday nights, a spokesperson from the museum said. Those tests will only last for a matter of hours, but on Tuesday, they'll be lit from sunset to sunrise. Made up of eighty-eight 7,000-watt light bulbs, the spectacle is visible from roughly 60 miles away on a clear night. The beams reach up to four miles into the sky, or roughly 12 times the height of the original Twin Towers. They’re so bright, in fact, that they’ve been known to disrupt the migration patterns of entire flocks of birds. 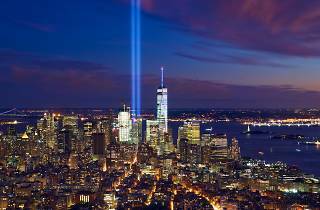 “Tribute in Light” first debuted in March 2002, just six months after the attacks of September 11th. It was set up in a vacant lot across from ground zero, and has since been moved to the roof of a downtown parking garage. It’s one of the more moving ways that the nation commemorates the largest terrorist attack to ever take place on U.S. soil, and serves as a strong symbol for New York City’s resilience.